I'd known of Jefferies writing for years, though to my shame never became familiar with all his output. Then a few years back having been asked to be a Trustee of his Museum near Swindon I joined the Society... a steal these days at only £12 a year. For that members receive a newsletter and the Journal on a regular basis. I love receiving the Journal as it gives an insight into Jefferies I would not have been able to educate myself on otherwise. Jefferies was a journalist at heart, who wrote in a way that his words passed down the generations long after the scribbling's of other journalists of his day have been forgotten. Partly because he wrote in a more creative way than a news hack, partly his works were then bound up into books for public consumption. Many Victorian novelists serialised their work prior to book publication; Jefferies though wrote from the heart, often campaigning against agricultural or rural ways. Not in a sentimental way, but always looking forward by understanding the past and present. The summer Journal above contains an insightful summary of Jefferies the Journalist, by Barry Sloan, a printed version of the Jefferies Birthday lecture he gave last year. In those 10 pages, a life in précis, I feel closer to Jefferies than ever before, and though sadly no longer able to fulfil a role of Trustee for the museum, feel my understanding of Jefferies the man is increasing, over and above Jefferies the author. Yet the words of Jefferies the author have as much a clear message today and they did over 100 years ago. For as many don't realise who come to Jefferies through his countryside prose, Jefferies was one of the first, if not the first environmentalists. Read After London and you'll see what I mean! 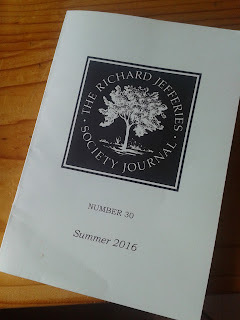 The Richard Jefferies Society - founded in 1950 to promote the appreciation and study of Jefferies works.